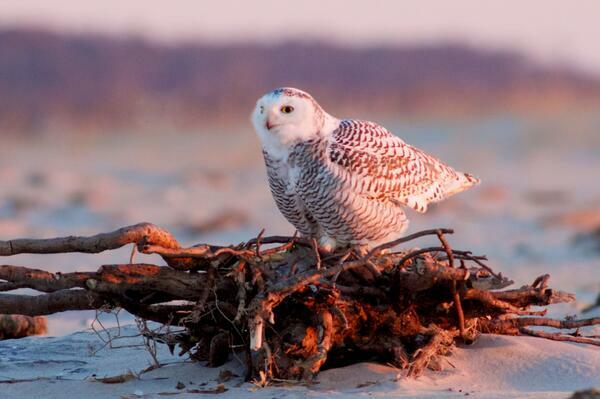 Home | news | Snowy Owls on Assateague! There’s been a lot of talk over the past month or so about the appearance of several Snowy Owls in the Chincoteague and Assateague area. Hedwig look-a-likes may be neat, but some folks are wondering, owls–we see owls all the time–what’s the big deal? This great white owl is a beautiful sight as it perches upright on a fence post or flies over a marsh. Strictly a bird of open country, it is practically never seen in a tree; it sits on the ground, a rooftop, or other exposed resting place. In the Far North where it breeds, it depends largely on lemmings for food. The size of the lemming population periodically changes (due to population explosions and subsequent epidemics), and when lemming numbers decrease the owls must migrate southward to avoid starvation. In southern latitudes, the owls prey on rabbits, waterfowl, and other game, or on dead fish on ocean beaches. The big deal is that the snowy owl very rarely comes this far south. A quick Audubon search shows their winter range to extend as far south as New York and New Jersey on occasion, but they appear to stay in the very northern states for the most part, even during winter. The difference this year is that they are journeying further south in search of food. They prey on small animals such as lemmings, rabbits, and waterfowl. This may explain why they have been spotted on Assateague, as much of the island is a dedicated wildlife sanctuary where animals are king and, I imagine, would be a buffet for a hungry owl. This flight to warmer climates is called an irruption, and this winter’s irruption is the largest in decades. Their project is in desperate need of immediate funding, as the irruption this year is historic and could very well be a once-in-a-lifetime opportunity to study the habits of these majestic predators. Locals and visitors alike have spent countless hours in search of Snowy Owls in our area the past month. Many excellent photos have come as a result of their dedication. I’ve compiled a few of my favorites below for your enjoyment! This photo by Barbara Houston, found on Facebook, captures a snowy owl in flight at Tom’s Cove on Assateague, in front of the famous Assateague Lighthouse.